Winners For EHA Sunshield 24hr! 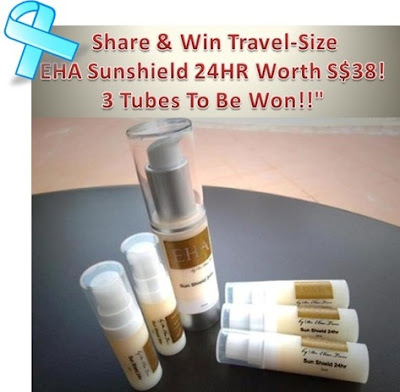 You are here:Home » EHA Skincare » Winners For EHA Sunshield 24hr! EHA’s Sun Shield 24hr has been proven to block both UV-A & UV-B rays by 99%, for a period of 24 hours, with just one application! I've been diligently using the EHA Sun Shield 24hr given by Dr Tam after my IPL/Laser session. Love the sunblock as I hate reapplying every few hours. With this, I just have to apply once & that's it! Now, I'll share this awesome product with 3 of my lucky readers. Winners, please acknowledge this post & email me your Name, NRIC, Email & HP no @ blackswanst@hotmail.com within 48hrs or another winner will be selected. I'll be following up with a letter for your prize collection. Due to no response from Julia Chan, another winner has been picked - Jamie Quek of S73xxxxx! Due to no response from Jamie Quek, prize will be awarded back to Julia Chan as she had reverted! Thank you EHA, for sponsoring this Giveaway! Check out my IPL/Laser For Pigmentation At EHA Clinic & their current promotion! email sent ! Thanks shirley ! Thank you so much, hv emailed you.